We have just extended our deadline date to 2/26/2018 for our call to Artists for ENGAGE Art Fair 2018, the kick-off event for Arts in April Napa Valley. ENGAGE Art Fair will return for its fourth year as a signature event of Napa Valley Arts in April’s showcase of the arts. ENGAGE Art Fair provides an interactive, sensory experience for guests in an alternative art fair setting. Presented by Celebrate! Napa Valley, ENGAGE Art Fair is the anchor event of SARAFORNIA and is an annual, curated and immersive affair featuring some of the Bay Area’s best artists, craftspeople, and performers who gather in Calistoga to meet, create and engage with the public. SARAFORNIA: Art | Music | Food | Wine, held over the first weekend of April, is the kick-off celebration of Napa Valley Arts in April and is a collaboration of Celebrate! Napa Valley, Arts Council Napa Valley, and Visit Calistoga. 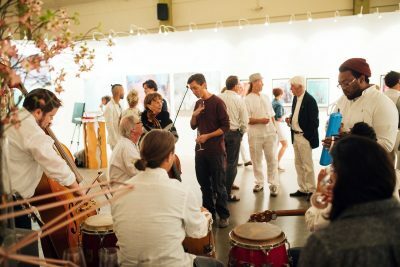 Selected Artists are invited to display their work in an 11,000 sq ft converted gallery space that is designed to promote interaction between the Artists and audience. ENGAGE Art Fair opens on Friday night with a ticketed preview party, followed by complimentary public access both Saturday and Sunday.